One of the greatest pitchers ever to take the mound in America's national pastime was my father's second cousin Walter Perry Johnson. Walter was born in Kansas in 1887 and moved to Olinda, California, in 1902 along with many of his Perry relatives. He made his major league debut in 1907, the year in which my father was born. Dad told me that Walter once sent an autographed baseball to his Urbana (Ohio) cousins, but that Dad and his brother took the ball out and threw and batted it around until any autograph was unrecognizable. In 1992, I was honored to be invited by Walter's grandson, Henry Thomas, to assist him with the research for the Johnson biography he was writing. I visited Walter's daughter (Hank's mother) Carolyn at her home in Washington, DC, and got to thumb through the scrapbooks into which Walter's wife Hazel had pasted clippings chronicling his career. These scrapbooks were a source of much invaluable information for Henry Thomas' book. 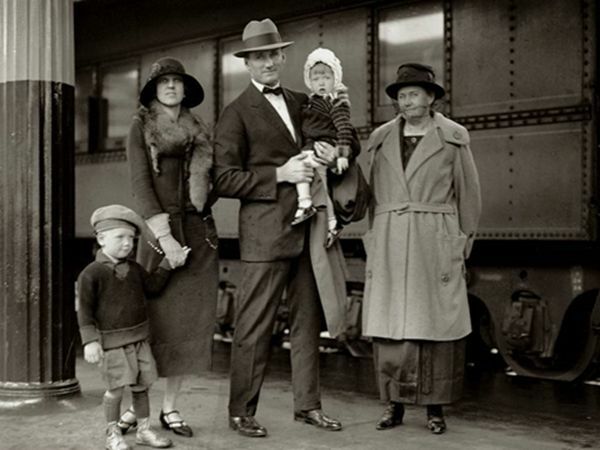 In the photo at the right, taken about 1925, we see the Johnson family: son Robert (Bob), Hazel, Walter, Carolyn, and mother Minnie. 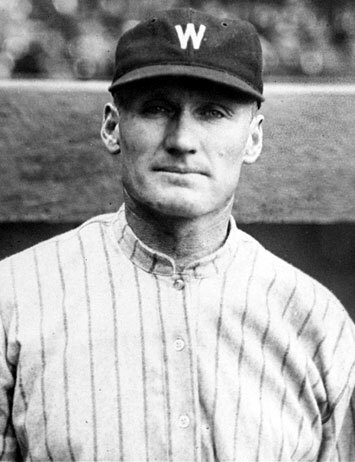 Walter Johnson, Baseball's Big Train was published in 1995 by Phenom Press and may still be available in the University of Nebraska's paperback edition. A byproduct of the enormous amount of research which went into the book was an article in the 1995 edition of Grandstand Baseball Annual describing Johnson's formative years in California. This article and some other material which isn't available to the general public are included in this Carey family album. In 2006, with a lot of help from Henry, I wrote a very brief Walter Johnson biosketch for the Society for American Baseball Research (SABR)'s biography project. I make no claims for this article's literary qualities, but if you'd like a quick summary of Walter's life, check it out! There are no less than 220 references to Walter Johnson in Baseball Magazine, published from 1908 to 1918 and available on line at the LA84 Foundation in Los Angeles. A very quick search of these magazines turned up several interesting articles. 1 Walter appears for only five seconds or so in this 4-minute newsreel, which was discovered nearly 90 years after he pitched the last 4 innings of the Nationals' win in the final game of the 1924 World Series. But I felt it was worth providing this link to the site where the newsreel is displayed. The film is in near-mint condition and gives you the feel of what it was like to be at this incredible moment in baseball history. 2 This video, prepared by a University of Colorado college student in 2016, is perhaps the most moving tribute to Walter I've ever seen. Don't miss it! 3 The links in this infobox were checked and updated in January 2018. If you know of additional information on Walter which is available on the World Wide Web, please let us know, and we will add links to it here. This page was last updated 15 Jan 2018.